The legal industry is notorious for generating mounds of paperwork. That means a high-volume print environment. We know your team’s time is better spent moving through casework than managing toner or troubleshooting printer issues, so Managed Print Services (MPS) handle all of that for you. And much more. MPS provides automatic toner replacement and delivery, routine maintenance, responsive repairs and comprehensive usage analytics. By freeing up your office and IT resources for other value-add efforts in your firm, you’re improving productivity for everyone involved. 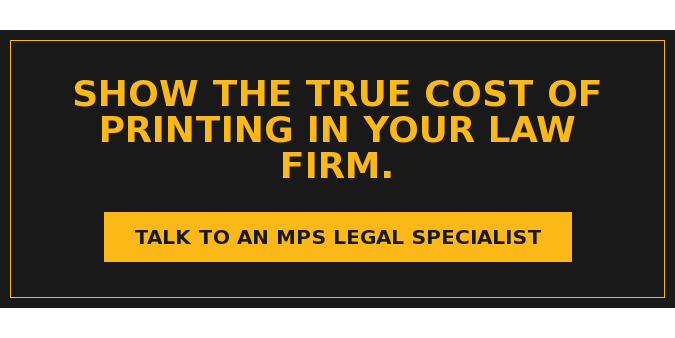 With printing tied so closely to revenue generation in law firms, downtime means lost dollars. That’s why Managed Print Services can make such a dramatic impact. Marco puts timely, effective and efficient service at your beck and call, no matter where your offices are located. Our first-call resolution rates are some of the best in the industry. And our on-site service extends halfway around the globe. Our white glove service option allows you to outsource even minor print support tasks to a Marco expert. If you’re looking for a managed print partner who sets the bar high on service … and then holds itself accountable to deliver on that promise, you’ve found it right here.